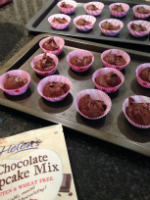 I was pleased to bake, taste and review Food by Helen mixes . This brand was new to me, only recently spotted it on Twitter so was keen to find out more. 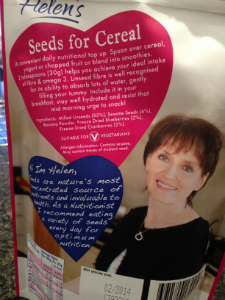 The brain child of Food by Helen is Helen O’Dowd a qualified nutritionist and food scientist. 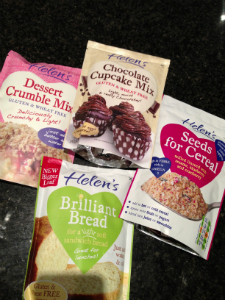 I have been able to try the gluten free chocolate cup cake mix and the crumble mix and also sampled the seeds for cereal. 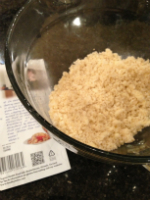 In a later blog post I will bake and review Helen’s bread mix. 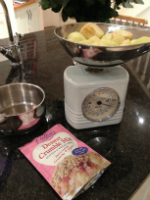 Firstly I decided to make an apple crumble using Helen’s mix. It was very simple to make the instructions were easy to follow. 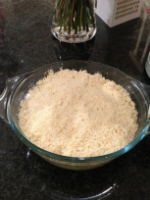 The millet flour felt quite different to use, a slightly gritty texture. The butter rubbed in easily and I added to my cooked apple. 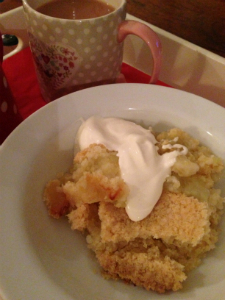 The crumble was a great success, it had a good crunch to the crumble. Something I struggle with when I make from scratch using gluten free flour. Once again the instructions were easy to follow, just add 4 eggs, butter and water. It was good to see butter suggested as the fat choice as opposed to vegetable oil or margarine. Sadly the first ingredient mentioned is sugar , higher even than the rice flour. Pleased to see Helen also does mention on the reverse of the packet that these are meant as a treat for a party or other special occasion, rather than an every day food. 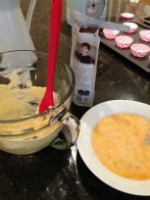 I enjoy making cakes by hand so I didn’t take Helen’s advice to use a mixer, I was very pleased with the results. The cakes were a real success. 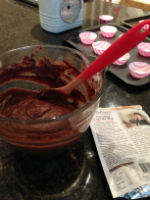 I followed the instructions to make the buttercream icing.The ingredients are not provided in the packet. My testers the family thought they had a good texture and a strong chocolatey flavour. 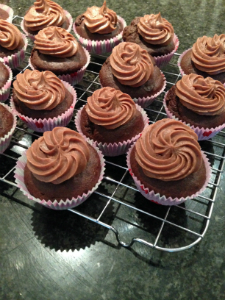 Possibly more adult cup cakes rather than for children. They loved the buttercream too. 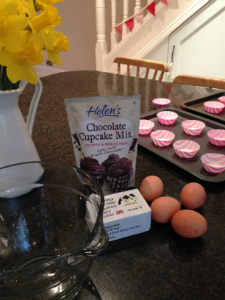 looks like a big thumbs up again for Helen’s cup cake mix. My family eat both gluten free and gluten filled cakes so make good Guinea pigs. As someone living completely gluten free I would agree the cakes tasted light and had a deep chocolate flavour. 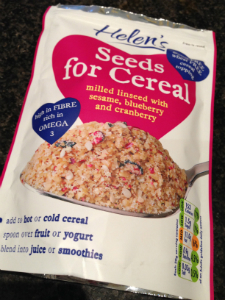 Finally I tested out Helen’s Seeds for cereal a topping to add to cereal, porridge , yoghurt etc containing milled linseed with sesame. the one I tried had blueberry and cranberry added. I look forward to trying the bread mix very soon.